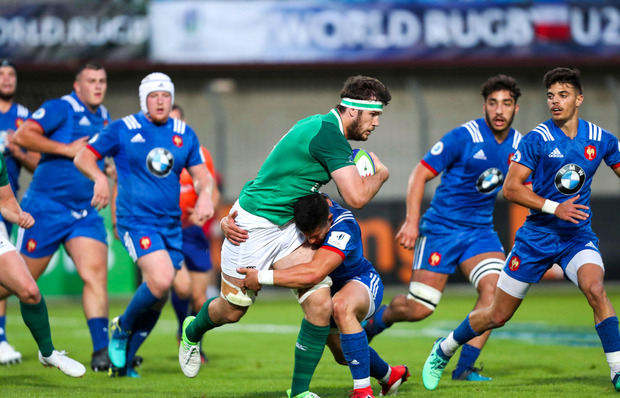 A powerful second half performance from France saw Ireland fall to a narrow defeat in their opening U20 World Championship game in Perpignan tonight. Noel McNamara's side started brightly, leading 17-5 at the break, but an explosive start to the second half from the French proved crucial as they scored three quick-fire tries to move into a 26-17 lead. A late score from out-half Harry Byrne, which he converted himself, narrowed the gap to just two points but despite some nervy moments, the hosts held out. The home side got off to the perfect start, with left wing Maxime Marty touching down in the corner after the French regained possession in the Ireland 22 following a blocked clearance kick. Ireland didn't drop their heads though, and slowly worked their way back into the game as they began to dominate possession. Byrne was off-target with his first attempt of the night, but slotted his second from 35m. Ireland didn't have to wait long for their first try, with Donegal blindside flanker Joe Dunleavy showing great power to burrow over from close range. The TMO was required to verify the score, and in a testament to the Irish teamwork, mentioned that Dunleavy was driven over the line by captain Caelan Dorris. Toulouse wing Marty thought he had his second score - again in the left corner - after finishing off a flowing move. However, replays showed that his foot was on the line as he grounded the ball. And the TMO ruled a try out at the other end too, wiping wing Tom Roche's interception effort off the board after a Jack Aungier high tackle. The tighthead prop was given ten minutes in the sin bin but it was Ireland who struck again before half time. After a sloppy French knock on in their own 22, Ireland recycled the ball diligently before scrum-half Hugh O'Sullivan sniped over on the whistle. Byrne converted to give Ireland a 12-point lead at the break. However, a French blitz at the start of the second half turned the game. Tries from Arthur Coville, Romain Ntamack and a second score from Marty put France nine points clear. It looked like they might run away with it and that stage, but Ireland dug in well and secured some key turnover penalties to keep in the hunt. Byrne's score gave them hope, and after winning another key penalty in defence, Ireland manufactured a lineout deep in the French 22 with one minute to go. However, the home side won possession to seal tight victory, and Ireland move on to face South Africa on Sunday.